Assessing the overall budget for your congress to ensure complete financial coverage. Mailing lists (typing address lists, printing out envelopes, folding and dispatching letters, pli, expédition). Liasing with your partners (pharmaceutical firms and official bodies) to obtain subsidies. Contacting suppliers : printer (to design and print the programs, posters, envelopes), hiring audio-visual aids, caterer, etc. 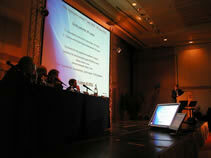 Corresponding with the speakers in English or in French to determine their AV, hotel (...) needs. Booking airline and train tickets at reduced rates. Computerized management of registration (including a complete list of participants). Management of hotel reservations (accommodations and meeting rooms). Entertainment for the evening (band, professional one-man show, initiation to the science of wine, etc).